Bob is a young boy who uses his imagination to turn his daily bath into an amazing adventure in which he encounters boats, sea creatures, and a water fall. When his bath is over, the brave Captain Bob drains the ocean and gets ready for bed. 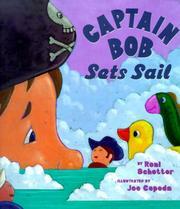 Schotter, Roni, “Captain bob sets sail,” Children's Picture Book Database at Miami University, accessed April 21, 2019, https://dlp.lib.miamioh.edu/picturebook/items/show/7712.